All appliances in the kitchen are from Thermador, save for a Miele dishwasher. Bright white Caesarstone bounces yet more light into the space. The modestly scaled master bedroom opens to a view of the woods located behind the property. The seating area features custom sofas covered in synthetic ultrasuede, in what Dowling calls “a forgiving color.” The felt ottoman, by Cini Boeri for Knoll, doubles as a table thanks to a lacquered tray from Williams-Sonoma Home. The sisal rug is from West Elm. When a young San Francisco couple with two little children sought a comfortable weekend retreat, they happened upon eight rolling acres in Sonoma County surrounded by grassy meadows, redwood groves, and the kind of small vineyards that abound just an hour north of the city. The home, completed in spring 2012 by architects Leslie and Julie Dowling, identical twins and protégées of Michael Graves, is comprised of two linked 1,000-square-foot wings. The volumes echo architect Philip Johnson’s 1949 Glass House in New Canaan, Connecticut, though it avoids the 1949 structure's iconic exhibitionism. The simply detailed, taut, flat-roofed home’s two wings form a T-shape. One wing runs north to south, parallel to a pool, and contains the open-plan living spaces. It is essentially a loftlike great room with three walls of floor-to-ceiling Fleetwood sliding doors that open to wide concrete patios shaded by deep roof overhangs. The doors allow easy indoor-outdoor living and provide remarkably efficient “air-conditioned” spaces on even the hottest days, while a two-sided interior-exterior fireplace makes the north patio a winter favorite. The other wing contains a master suite, a children’s room with bunk beds, and a studio that doubles as a guest room. 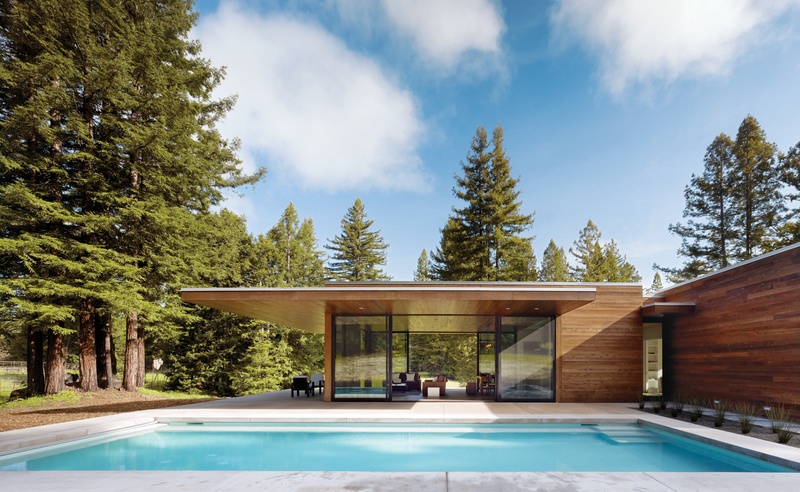 A limited palette of wood, concrete, and metal; solar and radiant heating systems; and efficient construction methods all work together to exceed California's stringent energy codes by 15 percent. “Small homes designed for flexibility are often the most sustainable,” says the architect.